Salon des Artistes Français, Paris, 1904, no. 1582. Ludovic Baschet, Catalogue illustré du Salon de 1904,Paris, 1904, np, no. 1582. Cesare Saccaggi: Un poliedrico pittore internazionale,Gabbantichita Tortona,on line publication, 2000, pp. 32, 43, and 54. Cesare Saccaggi: Tra Eros e Pan, exhib. cat., Palazzo Guidobono, Tortona, 2009, pp. 32, 171, and 178. Composed sometime between 1292 and 1294, the Vita nuova is one of the earliest works by the famed Italian poet Dante Alighieri (1265-1321) and one of the first important examples of Italian literary prose. 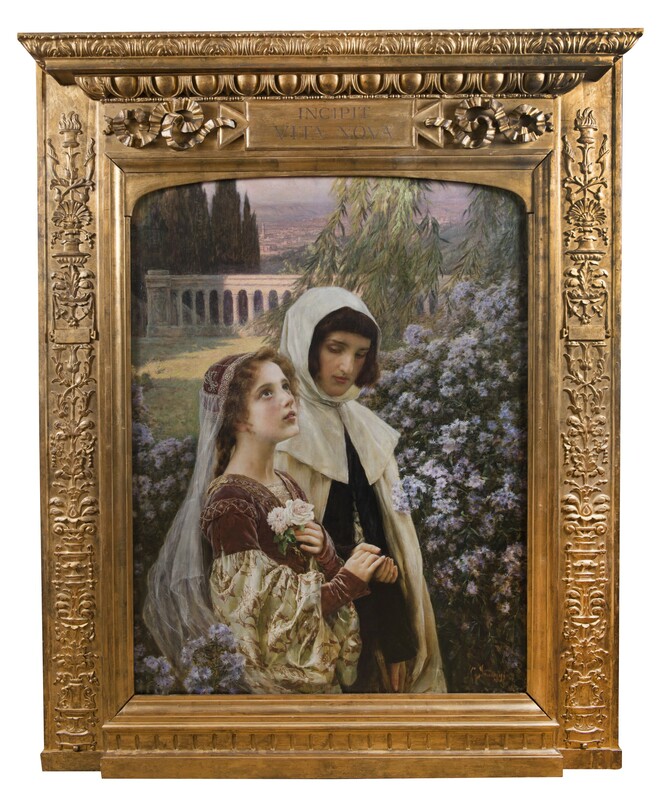 Dante called this his “Book of Memory,” and wrote “in the early part is found a chapter with the heading Incipit vita nova (Here begins a new life).” This “new life” which, as the inscription on the frame informs us, is the subject of this painting (fig. 1) was the poet’s first meeting in his hometown of Florence with the lovely Beatrice Portinari, who, though remaining distant, would become his passionate obsession and muse. Dante records that this first meeting took place when they were both nine years old and he describes her as “dressed in the most noble of colors, a subdued and decorous crimson.” For the precocious boy this was a momentous occasion, and his memory is that “at that moment the vital spirit in the inner chamber of my heart began to tremble violently…and my animal spirit said these words, ‘Now your bliss has appeared.’” And he continues, “From that time on Love governed my soul.” 1 The two young people were not to meet again until briefly nine years later and due to circumstances could never be joined. Both eventually married other spouses, and Beatrice died at age twenty-three in 1290, but Dante never stopped loving and remembering her, and she appears to him as a guide in the Divine Comedy . Dante purposely seems to omit any other details to provide a timeless, even mystical, aspect to this encounter. Artists were therefore free to invent their own interpretations. Most chose to depict the meeting of the mature couple. In addition to this painting by Saccaggi the only other located representation of the childhood encounter is an elaborate drawing by the English Pre-Raphaelite artist, Simeon Solomon (fig. 2). He curiously sets it in a Gothic chamber where the hesitant pair is surrounded by other children and their guardians. Saccaggi in his grand painting fills in the details with greater inventiveness. He places the scene in a Florentine garden, probably based on The Boboli, and shows a view of the city in the distance (fig. 3). Are these figures only nine years old and do they represent the overwhelming experience envisioned by Dante? They do seem adevoted pair completely enraptured with each other. Both wear head coverings perhaps to conveya sense of spiritual consecration. While Dante glances sideways at Beatrice, her pure, smooth face is looking upward as if to suggest a mystical calling. The lushness of the flowers and her garment add a sensual richness to this tender subject. dealer/publisher Goupil and successfully exhibited works at the annual Salon. Saccaggi did paint some portraits and landscapes, but he was best known for his richly-detailed, multi-figure historical and allegorical compositions. He was awarded a bronze medal at the Exposition Universelle of 1900 and a third class medal in 1903. Saccaggi returned to Tortona in 1905 but continued to exhibit at the Paris Salon until 1927, and his works were also shown in Rome, Venice, Buenos Aires, and New York. The present painting was included in the Salon of 1904 along with another of a seemingly historicizing subject entitled Elévation (fig. 4). A commemorative post card of the Dante subject published in 1907 (fig. 5) gives the same full title as that used in the Salon catalogue and is the one we are using above. It supposedly was to form part of a triptych dedicated to the poetry of Dante. This was a format the artist employed on occassion (figs. 6a-b), but apparently he did not in the end paint the other two portions. The sameyoung boy in his white hood (fig. 7) does appear in Saccaggi’s painting of 1901-02 Il voto (Les fidèles au pardon) . Not only the elaborate costumes but also the wonderful profusion of flowers painted in an almost impressionistic fashion seen in this Dante subject also occurred in other works by the painter of the period, most notably in The Annunciation (fig. 8). He also seems to have had a penchant for juxtaposing pairs of closely bound couples in romantic settings (figs. 9ae), and this one is certainly the most intimate with the chaste youngsters holding hands almost as if in a wedding ceremony. The elaborate carved and inscribed frame (fig. 10) designed undoubtedly by the artist serves to sethis subject in an appropriately Italianate Renaissance format evocative of a shrine.